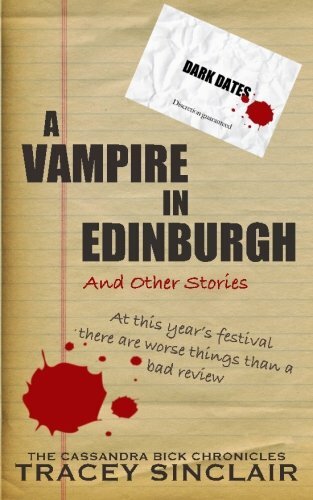 Vampire in Edinburgh is now in print! Continuing my mission to get the Dark Dates series into print, I have combined the three short stories A Vampire Walks Into a Bar, A Vampire Christmas and A Vampire In Edinburgh into one book and this is now available from Amazon (yes, I know a lot of people have issues with Amazon, but as an indie publisher my options are fairly limited). 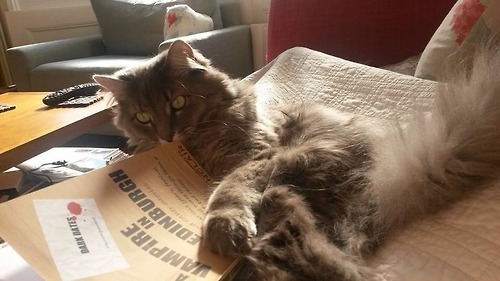 As you can see from the photo below, some people – or, indeed, cats – clearly prefer physical copies… (You can buy it here, and thanks as ever to Caroline from Red Button Publishing for helping with the formatting and cover). This entry was posted in Uncategorized and tagged Createspace, Dark Dates, indie publishing, short stories, Vampire Christmas, Vampire in Edinburgh. Bookmark the permalink.